Listen. There may be a Great Horned Owl near you! 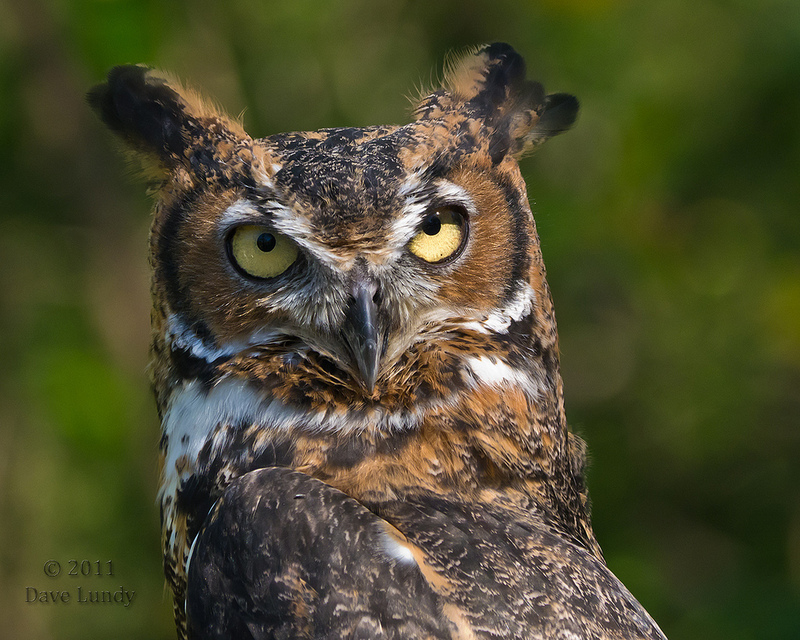 Great Horned Owls have a lot to say! When a pair of Great Horned Owls calls in a duet, the female usually hoots first, and the male replies at a lower pitch. Great Horned Owls may also pierce the darkness with an eerie shriek, which may signal a hungry owlet begging for food or a female defending its nest. They can also hiss, pop, meow, coo, and snap their bills. So have a listen after dark. 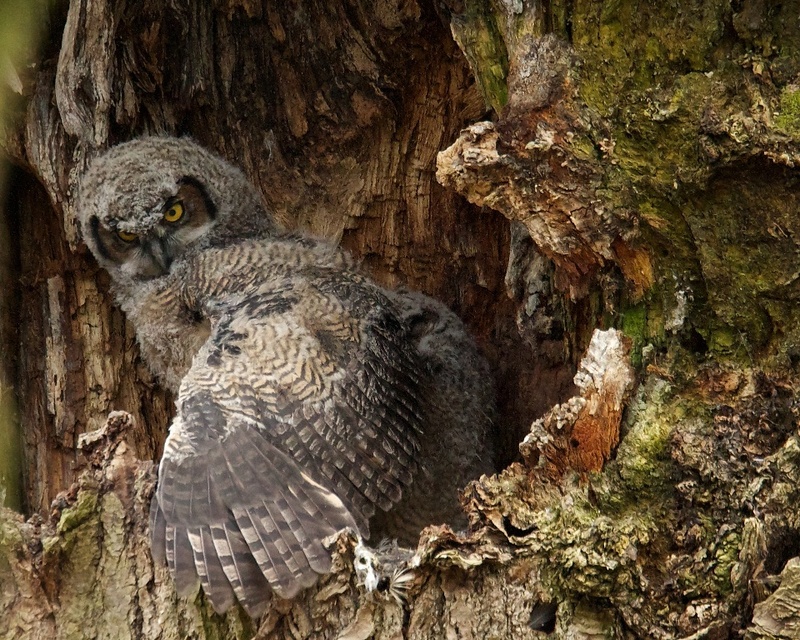 There may be a Great Horned Owl in your neighborhood! 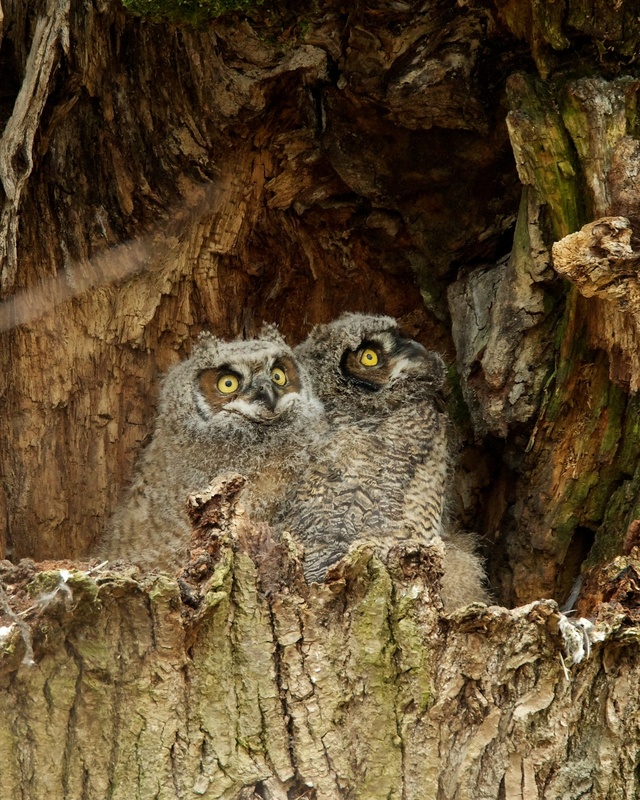 When a pair of Great Horned Owls calls in a duet, the female usually hoots first [female hooting], and the male replies at a lower pitch [male hooting]. Even though females average a third larger than males, the smaller male has a bigger voice box, or syrinx. Here’s the female again [female hooting]. Now the male [male hooting]. 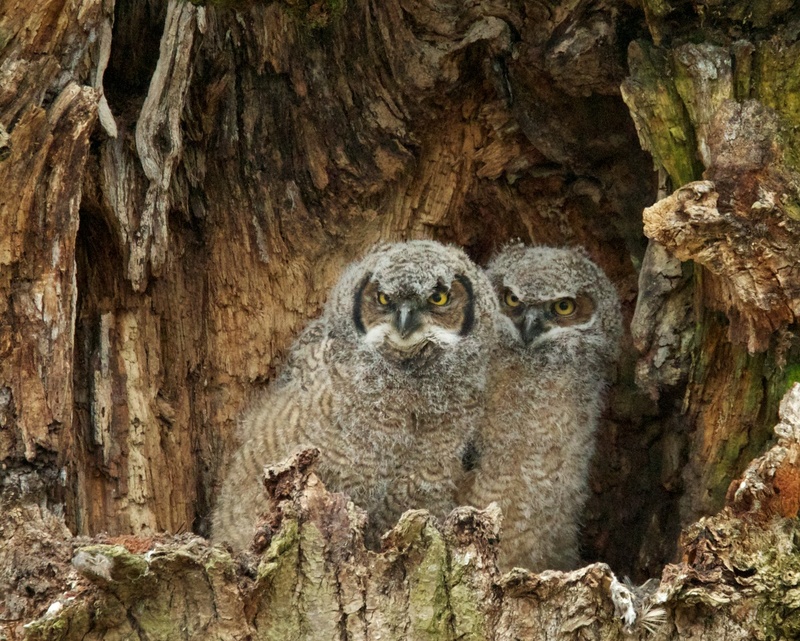 Great Horned Owls may also pierce the darkness with an eerie shriek [shriek of juvenile], which may signal a hungry owlet begging for food or a female defending its nest [shriek]. Adult owls also bark in response to threats [“bark” call]. 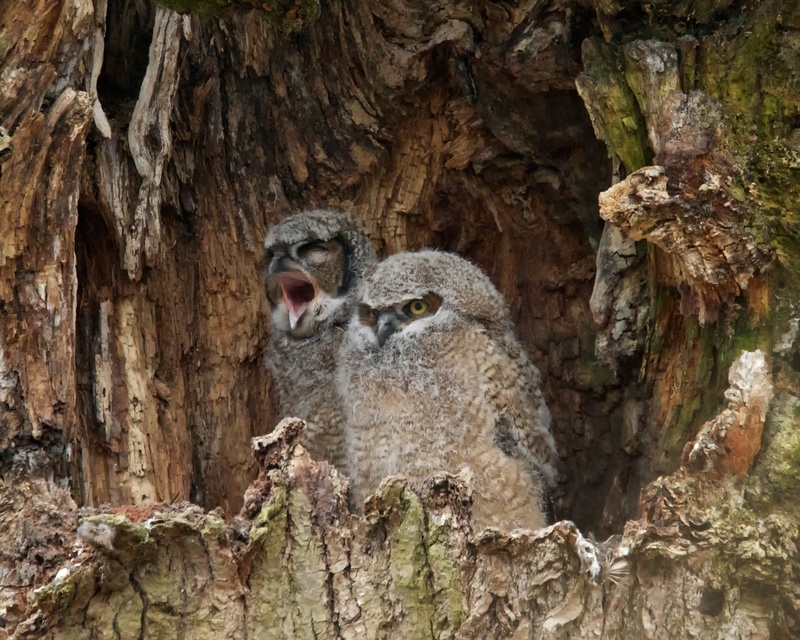 In fact, Great Horned Owls have a lot to say. Female owls sometimes call out with high-pitched trills [female “chitter” call] or hearty squawks [squawk], and Great Horned Owls hiss, pop, meow, coo, and snap their bills [bill snapping]. So have a listen after dark. There may be a Great Horned Owl in your neighborhood. [Great Horned Owl duet] Today’s show brought to you by The Bobolink Foundation. For BirdNote, I’m Michael Stein. Bird sounds provided by The Macaulay Library of Natural Sounds at the Cornell Lab of Ornithology, Ithaca, New York. Crickets [uned.] recorded by N. Tucker. Hoots of female and male Great Horned Owls  recorded by W.R.Fish; shriek of young Great Horned Owl  recorded by D.S.Herr; the “bark” of an adult Great Horned Owl [no #] recordist unknown, from “All About Birds”; “chitter” of female Great Horned Owl  and hearty squawk  recorded by W.L. Hershberger; and bill snapping of adult Great Horned Owl  by W.W.H.Gunn.